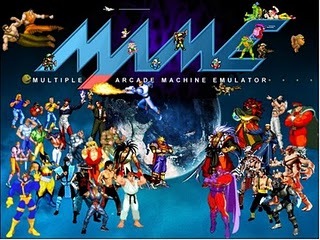 PalmMAME allows the arcade classic games to be emulated on any PalmOS5 device. On PalmOS devices with low dynamic RAM the Unlimited Dynamic Memory Hack utility may be required as well. This utility allows storage memory to be used as dynamic heap memory. Now based on MAME 0.37b5. So what are those two boxes on the loader screen with numbers? A. They allow you to underclock the emulated cpus. You see when you emulate a game like say PacMan, the emulated cpu is doing all the work the original would be -- and that includes sitting there idle waiting for the next piece of work to do! So the idea is to lower it so that the emulated chip is working harder and we end up with a faster game. Most games work fine with both CPU and Audio chips at 80% Some games work great even much lower. You will have to experiment to see what works fastest. Short Answer: Set them to 80 each to speed up the games!